ENSDF (Evaluated Nuclear Structure Data File) is the most important database storing nuclear structure information available worldwide . It is maintained by a network of evaluators, NSDD (Nuclear Structure and Decay Data Network) coordinated by IAEA. The purpose of this network is to compile and to evaluate the experimental nuclear structure information becoming available from the various facilities worldwide. Most of this activity is carried out within the NSDD Data Centres in North America, Europe and Asia. IFIN-HH hosts one of the two Data Centres currently active in Europe. We are responsible for the nuclei with the mass numbers A=57-59 and 117-119. The nuclear structure evaluation activity implies a good understanding of the experimental techniques, a detail-oriented approach and the use of various specific codes. The evaluator very often has to deal with discrepant data and to take decisions on which experimental data can be considered as the best available information on the structure of a certain nucleus. References [2-4] exemplify various nuclear structure evaluations completed by our group in collaboration with other members of NSDD. A. Negret, B. Singh, Nuclear Data Sheets for A=86, Nuclear Data Sheets 124, 1-156 (2015). A. Negret, B. Singh, Nuclear Data Sheets for A=75, Nuclear Data Sheets 114, 841-1140 (2013). D. De Frenne and A. Negret, Nuclear Data Sheets for A=106, Nuclear Data Sheets 109, 943-1102 (2008). While α-particle interactions with nuclei were of special interest from earliest days of nuclear physics, their unified description has been expected for two decades. However, even today their reaction cross sections predicted below the Coulomb barrier B can differ by even one order of magnitude, since the one-body complex optical model potential (OMP) which describes the combined effect of the Coulomb and nuclear field is still uncertain at these energies (e.g., former UEFISCDI project PN-II-ID-PCE-2008-2-43). Actually, widely-used phenomenological OMP parameters are derived from the analysis of elastic-scattering angular distributions, which are ruled out below B. Their extrapolation to lower energies is not appropriate due to the strong change in the number of open reaction channels close to B. This fact leads to a strong energy dependence of the OMP imaginary part , which takes into account all non-elastic interactions globally and accounts for the effect of removing flux from the elastic channel. Thus, the α-particle optical potential within this energy range can be validated only by analyzing reaction cross sections. However, because of their scarcity and small size due to the Coulomb barrier penetration, their analysis is challenging. Nevertheless, besides its basic interest, the accurate account of α-particle OMP is highly required by many astrophysics applications as well as fusion test facilities. The latter interest is due to the significant radiation damage of He bubbles following the α-particle emission in (n,α) reactions induced by fusion neutrons. On the other hand, there is a large number of high-precision measurements of α-particle induced reaction data below B even within latest couple of years which may provide an useful opportunity to investigate the results of a previous  OMP for α-particles on nuclei within the mass number range 45≤A≤209, established by (i) analysis  of α-particle elastic-scattering above B, and (ii) statistical model assessment of available (α,x) reaction cross sections at energies below B, and target nuclei either lower1 (A≤120) or heavier  . Its main point is a strong energy dependence of the surface imaginary-potential depth below 0.9B. Second, it is well-known a significant underestimation of the α-particle emission  by OMPs established through the analysis of the α-particle elastic scattering, obviously above B. Recently, a competition of the low-energy Coulomb excitation (CE) with the compound nucleus (CN) formation in α-particle induced reactions below B has been assumed  in order to make possible the description of the latter as well as the α-particle emission by the same OMP. However, following former comments , we have just shown  that the corresponding partial waves and integration radii provide evidence for a distinct account of CE and OM total-reaction cross section. Therefore, our actual overall objective is a suitable assessment of the α-particle OMP around B, for the incident as well as the outgoing reaction channels, which are of first interest for both nuclear technology and nuclear astrophysics. Since it is still considered  that there is no global OMP even for the incident α-particles, a primary objective should concern the further involvement of our global OMP  within the timely analysis of recent and forthcoming (α,x) reaction cross sections. The correct conclusions on the OMP suitability will depend critically on the accuracy of the rest of statistical model parameters, which could be provided only by their establishment or check by using other independent data. Next, it will be most useful for the accurate radiation assessment in fusion reactor the extension of our recent analysis of newly published proton-induced reaction cross sections for α-particle emission at energies below B, just proved to be well described by the same OMP  as for the incident channel . This conclusion should be however validated for more target nuclei, using eventually the enlarged data basis for (n,α) reactions. M. Avrigeanu et al., Atomic Data Nucl. Data Tables 95, 501 (2009). V. Avrigeanu et al., Phys. Rev. C 90, 044612 (2014), ibid. 94, 014606 (2016). M. Avrigeanu et al., Nucl. Phys. A723, 104 (2003), Nucl. Phys. A764, 246 (2006). M. Avrigeanu and V. Avrigeanu, Phys. Rev. C 82, 014606 (2010). T. Rauscher, Phys. Rev. Lett. 111, 061104 (2013). V. Avrigeanu, M. Avrigeanu, and C. Manailescu, arXiv:1605.05455 [nucl-th]. V. Avrigeanu and M. Avrigeanu, Phys. Rev. C 91, 064611 (2015). The deuteron-induced reactions at low and medium energies are of great importance for several on-going strategic research programmes at large-scale international level, as the International Thermonuclear Experimental Reactor (ITER), the International Fusion Material Irradiation Facility (IFMIF), related to the ITER fusion program, and the Neutron For Science (NFS) project at SPIRAL-2 facility. Thus, the European Commission (EC) domestic agency Fusion for Energy (F4E) for ITER has assigned a top priority to the task of selecting and validating the best materials for constructing ITER, while IFMIF will use a deuteron beam from a particle accelerator to produce a large neutron flux for material studies. The NFS project involves deuteron beams too, being focused on both academic research and applied physics. However, there are significant discrepancies between the existing experimental data and even the latest version of the evaluated data library TENDL-2015 based on calculations with the widely-used computer code TALYS. This is why a large attention has more recently paid to further measurements as well as to improved model calculations which should become finally able to describe the experimental data so that the deuteron data libraries may approach the standard of the current neutron libraries. The high complexity of the deuteron-nucleus interaction due to the deuteron weak binding energy of 2.224 MeV is also related to a variety of reactions induced by the deuteron-breakup nucleons. Thus, specific noncompound processes as the breakup (BU) and direct reactions (DR) make the deuteron-induced reactions so different from reactions with other incident particles. Since the scarce consideration of only the pre-equilibrium emission (PE) and compound-nucleus (CN) mechanisms, as within TALYS, led to significant discrepancies with experimental results, recommended reaction cross sections of high-priority elements have mainly been obtained by fit of the data. This has been the reason hampering so far the comprehensive analysis involving large A-range of targets and incident-energy domain. On the other hand, recent basic studies  of deuteron-induced reactions around the Coulomb barrier pointed out that numerical calculations for these reactions are beyond current capabilities while their case might contain interesting physics. However, it was not paid the due attention to the specific noncompound processes which should be considered for the deuteron-induced reactions, i.e. the deuteron breakup which is also followed by various reactions induced by the BU nucleons. Thus, the IFIN-HH team has just shown , in addition to previous basic studies , that there is a significant difference between the larger CN contribution obtained from measured neutron angular distributions, and decreased results of an unitary analysis of every deuteron-interaction mechanism due to the BU component. 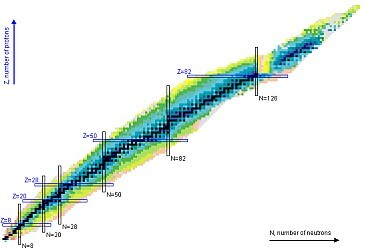 Moreover, it has been proved that use of the more realistic CN cross sections following the deuteron-interaction unitary and consistent analysis within the UEFISCDI project PN-II-ID-PCE-2011-3-0450 could improve the nuclear level densities which result from statistical neutron evaporation spectra, as well as the results of the surrogate-reaction method. Overall, further improvement of the theoretical description of deuteron interactions with nuclei that could be validated only by suitable description of experimental data. Thus, we plan to continue the series of recent studies  looking for consistent inclusion of the deuteron BU contribution within activation cross-section calculations by using (i) consistent input parameters determined by analysis of various independent data, and (ii) systematic account of whole body of related data for isotope chains and/or nearby atomic elements. A.P.D. Ramirez et al., Phys. Rev C 88, 064324 (2013); Y. Byun et al., ibid. 90, 044303 (2014). M. Avrigeanu and V. Avrigeanu, Phys. Rev. C 92, 021601(R) (2015). M. Avrigeanu et al., Fusion Eng. Design 84, 418 (2009), Phys. Rev. C 79, 044610(2009), ibid. 82, 054605 (2010); ibid. 84,014605(2011), ibid. 85, 034603 (2012). M. Avrigeanu et al., Phys. Rev. C 88, 014612 (2013), ibid. 89, 044613 (2014), ibid. 94, 014606 (2016).